What in the world is Scott Walker thinking? This is a man who was a winner, who won three straight times for governor, something few in state history have ever done. This is governor who reshaped this state and withstood controversy with far-reaching policies, from Act 10 to cutting property taxes to eliminating civil service to radically changing the state Department of Natural Resources. 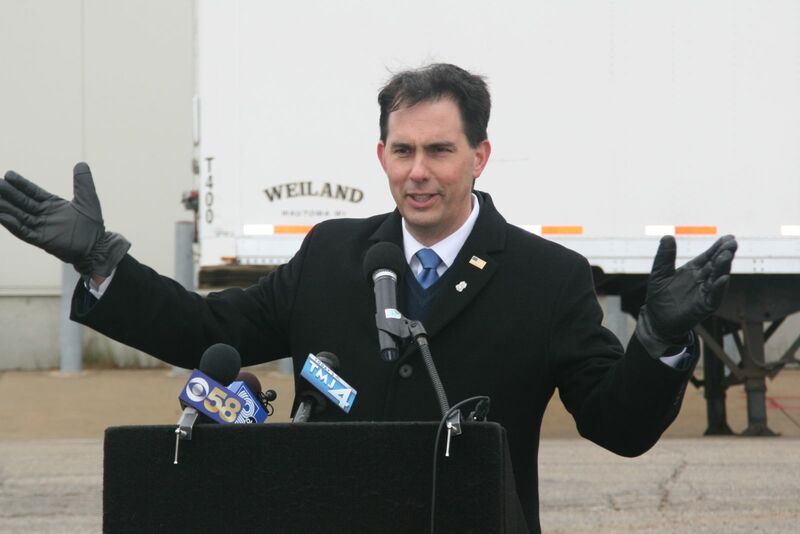 This is a leader who left an indelible stamp on Wisconsin with the conservative policies he pursued. And how has he decided to end his tenure? By showing he’s a poor loser with a contempt for the voter’s wishes. Is this how Walker wants to be remembered? Most of the attention over the lame duck legislation that was just passed has been on Republican Senate Majority Leader Scott Fitzgerald and Assembly Speaker Robin Vos, who have fashioned an omnibus set of laws intended to constrain incoming governor Tony Evers and Attorney General Josh Kaul from carrying out policies they campaigned on and helped assure their victory. But Vos and Fitzgerald have clearly worked with Walker on this plan, who says he will sign the legislation. When Walker was elected in 2010, he wrote a two-page letter to outgoing Governor Jim Doyle asking him to refrain from making any permanent appointments, issuing any new or updated administrative rules, or taking any actions to implement the federal Affordable Care Act. Doyle complied. He also announced he would not take any actions to implement the federal high speed rail grant he had won, since Walker opposed this. As Doyle explained to The Cap Times, he was operating in the spirit of past governors. He noted that former Republican Gov. Scott McCallum was gracious and “classy” after he lost to Doyle in 2002. “He understood it’s our democracy that matters more than whether one party or another happens to hold onto power,” Doyle said. Contrast this to Walker. The man who wanted Doyle to make no permanent appointments has done lame-duck appointments of 81 people, which the Republican-dominated Senate approved to serve on a long list of boards, authorities, and councils concerned with seemingly every conceivable aspect of state business. As Evers and others have complained, these were rush jobs done without the usual public hearings and without financial disclosure of appointees’ possible conflicts. The bills Walker intends to sign also revamps the Wisconsin Economic Development Corp. board, giving the legislature rather than the governor power to appoint the WEDC’s leader until next September. Given that the WEDC oversees the $4.1 billion subsidy with Foxconn and that Evers’ campaign emphasized his intent to look carefully at this deal, which most voters don’t support, this action is clearly done to invalidate the last election. It’s also bad policy, which is why “eight former heads of the state’s job-creation efforts”, including two appointed by Walker, urged the Legislature not to take this action, as the Journal Sentinel reported. Walker didn’t want any new rules issued by Doyle, but has indicated he will sign legislation permanently constraining Evers’ rule making on any state laws. Evers will also need to get permission from the Legislature before asking the federal government to make any changes to jointly-run state and federal programs. Walker didn’t want Doyle to make any changes on the federal Affordable Care Act, but appears eager to sign legislation that would constrain Evers and Kaul from withdrawing the state from a lawsuit seeking to overturn the Affordable Care Act and its coverage of pre-existing conditions. Probably no issue was more important to voters across the nation or to the victory of both Evers and Kaul. But Walker and the Republicans have no problem denying the will of the electorate on an issue so critical to countless voters’ health and personal finances. Walker was even willing to approve a bill that would add an unprecedented March election in 2020 to help conservative Wisconsin Supreme Court Justice Daniel Kelly win reelection. Never mind that it would cost the taxpayers $6.8 million. Never mind that voters would face three straight months of elections, in February, March and April. Anything to assure the election of one more conservative. Even Vos and Fitzgerald backed off from this one, after county clerks across the state said three straight months of elections would be too difficult to administer, and the bipartisan Wisconsin Elections Commission urged the legislature not to pass the law. Vos has insisted that voters in the November election opted for divided government, giving legislators license to engage in all this lame duck mischief. Leaving aside the fact they run in gerrymandered districts that guarantee them a majority if the statewide vote is 55 percent Democratic, the fact is that legislators did not run for reelection on a platform of constraining the power of the governor. But Evers and Kaul did make promises to the voters that these laws aim to deny. Vos and Fitzgerald clearly don’t care about such niceties. They are still in office and intent on doing whatever they can to stack the deck against the governor. But what is the incentive for Walker? Is this just cheap revenge agains the man who defeated him? Is he just following the bidding of conservative power brokers like the Koch Brothers and the Wisconsin Manufacturers and Commerce, as some have suggested? Only Walker knows his motivation for encouraging this partisan ugliness, but he might consider the impact on his reputation. Walker has spent nearly his entire life in politics and probably still hopes to run again. But these lame duck laws are the kind of thing that don’t get forgotten. Going all the way back to the “midnight appointments” by the Federalists in 1800, which helped assure the demise of that party, Americans have shown a concern with the orderly transfer of power after the votes are counted. There’s still time to prove Lubar is right. Like so many governors and presidents before him, like George H.W. Bush and Barack Obama, who were so gracious to the presidents who succeeded them, Walker could embrace the best traditions of the American system and reject these insidious laws. The voters have spoken. All Walker need do is heed their will. One can dream, but Walker is no doubt looking at some big fat job with a Koch-funded organization and he is not going to screw it up. ALEC needs to be included in this list. The strings that control Walker will not allow him to do otherwise. Walker is not his own man – never has been. Futhermore he would go to his grave rather than do something good ( in a progressive’s eyes ) for the state or admit he did something wrong. He wants his legacy good or bad to live on. It will be interesting to see where he lands and hopefully it’s out of state just like Clarke yet I suspect he’s itching to get right back into the policital saddle and run for something in WI – perhaps Johnson’s seat because he “ wants to bring the reforms he passed in WI to Washington..” – right ? Then again – we’ve grown weary of his BS. My hope is that Walker will heed the advice of Lubar and Murphy. My fear is that the 2010/11 chants of “Walker is a weasel” will be heard again soon on streets all over this state. Walker’s legacy in a word is LOSER. He won 3 elections for governor through chicanery, but his terms turned a winning state into a loser. When he said “forward,” he meant “backward. His reactionary policies diminished our middle class and turned us into WISSISSIPPI. With the help of shameless gerrymandering and reactionary state senates and assemblies, he erased the word PROGRESSIVE from our state identity. Walker encouraged wealthy special interests to turn our once progressive state supreme court from the status of distinguished to the status of partisan hack. 2 words on Walker’s legacy: LOSER and BACKWARDS. If Walker does not veto most or all of the bullshoes promoted in the recent lame duck session, an adjective may be applicable: SORE LOSER. I would not be surprised if Walker does nothing; neither signing nor vetoing these bills. Then he will say that he had nothing to do with them. HOWEVER, it has become clear that these bills and the machination behind them were planned last spring by Walker, Vos and Fitzgerald. Hypocrite Walker may try to flash his puppy dog innocent eyes, but he is up to his neck in this slimy undemocratic power play. Adjectives re Walker’s legacy as governor have multiplied since he signed the small-minded, mean-spirited, vindictive legislation in the lame duck session to limit the powers of his successor and the in-coming attorney general. The governor is leaving office as a morally challenged and just plain nasty man.